MiTAC International announced their first ARM server (MiTAC GFX) based on Marvell ARMADA XP SoC and running Ubuntu 12.04 LTS at Computex 2012, in Taipei. This solution appears to be similar to Dell “Copper” ARM server announced last week, which also uses Marvel ARMADA XP and runs Ubuntu 12.04, except its intended to be a real product rather than just a prototype. The MiTAC GFX with ASX-1 module is intended for deployment as a general purpose server where real estate, efficiency and throughput at a realistic price are key factors and typical applications include web hosting, web browsing, email, chat, social media and networking, etc. Later, MiTAC will introduce an ASX-HP (High Performance) module for compute intensive workloads that can be add to GFX system, and ASX modules featuring 64-bit SoC are under development. MiTAC showcased a GFX System with 64 nodes (that’s 256 Cortex A9 cores) at Computex 2012, which is still on display at the Canonical booth until the end of the conference on June 10. 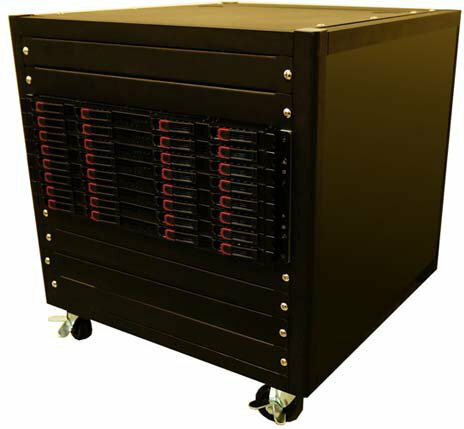 The demo platform above features 18.75 TB of storage and consumes less than 1000 Watts. In many case, applications in powerful Intel server (e.g. Xeon) just use about 15% of the CPU whereas most of work needed is high data throughput, and powerful CPU are not really needed. in servers. ARM expects to compete in 25% of the server market, as the main issue is legacy software such as SAP (and other CRM software) and Microsoft server that most probably won’t be ported to ARM. So instead ARM focus on open source server software such as LAMP. Ian Ferguson says he is working towards the “Raspberry Pi” of servers, a low cost low power ARM server solutions for countries such as the ones in Africa where they are lower resources requirements (e.g. Fishermen use their phone to check the price of fish in different markets), but strict power requirements. Pricing is not available publicly for those servers, and I could not find information about availability. The server is planned to be available in Q4 2012. They 20-minute ARM Server presentation video at Computex is also available. This is a must see if you are interesting in ARM servers. I only knew Mitac as an OEM producing computers for others. Is Mitac approaching the market with these ARM-servers under its own name? – the *mean* CPU usage could very well be only 15%, but computing is often about peak performance. And an Intel CPU can deliver much more peak performance than an ARM CPU. – how does a system with a Intel/AMD x86 CPU and virtual machines compare to a system with a lot of individual ARM systems? Interesting items: processingpower/Watt, peak performance, price/system, price/performance. I really hope ARM systems are going to be a success in the market that’s now dominated by x86, but I still find it difficult to understand how. It was the first time I ever heard of Mitac. You must be right about peak performance, but I don’t know enough about servers to know if it is critical or not. I suppose for an FTP server, the processor is not that important, but for database queries, I/O and processor should be more important. How is ARM going to compete with Intel? If I remember well, in the video, they said they can provide 3 to 5 times better performance per watt, so ARM server TCO may be lower. In an older post, I tried to calculate the cost of Google datacenter in Oregon between Intel and ARM http://www.cnx-software.com/2010/11/16/arm-based-embedded-servers-marvell-armada-xp/. I made some assumptions there which may be completely wrong, but even if you change the percentage, cost savings would still be in millions of US dollars. However, Dell said their customers are not really interested in 32-bit ARM servers, and are waiting for 64-bit servers instead, using the 32-bit platform only for evaluation and testing. So it’s probably a few more years before we see ARM servers take off.